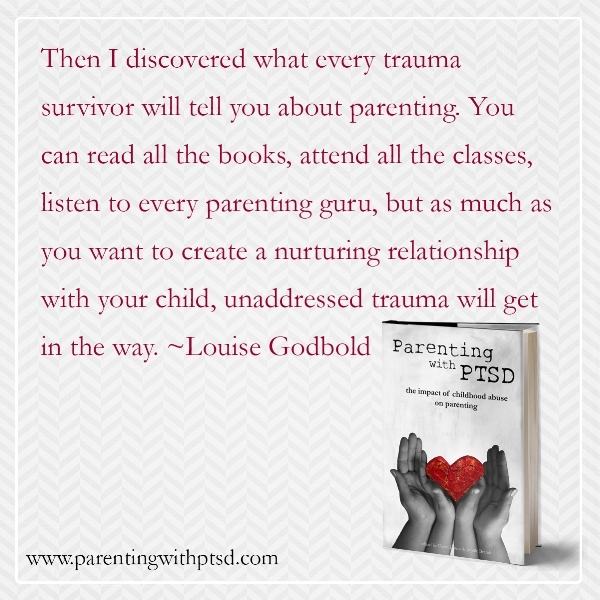 Parenting with PTSD release day! I am so exhausted and excited to announce that Parenting with PTSD is now available on Amazon! From Oct 12-14, you can download a free copy! October 12, 2017 marks the release of Parenting with PTSD, the book that breaks the silence about parenting after childhood trauma, so that parents can break the cycle of abuse. For survivors of childhood abuse, becoming a parent is marked by a sudden resurgence of trauma triggers. At every stage of parenthood, from pregnancy to the teen years, there are moments when mothers and fathers experience flashbacks, depression, anxiety and other symptoms related to their untreated post traumatic stress. Most parents are completely blindsided by them because no one talks about it. Over the last two decades, science and research on toxic stress and adverse childhood experiences (ACEs) has shown us that abuse which occurs during childhood interrupts healthy brain and body development. Some children who experience this interference in healthy development will be supported with therapeutic interventions; most will not. As these survivors of childhood abuse grow up, they find ways to cope with their untreated post traumatic stress, usually through avoidance and numbing. After they become parents, those strategies are no longer effective. Parenting survivors need support to get through the flashbacks and other post-traumatic stress symptoms they will experience. As new mothers, editors and contributing authors Dawn Daum (of Northville, NY) and Joyelle Brandt (of Port Moody, BC) both went looking online and on book shelves for something to validate how they were experiencing motherhood, but never found what they needed. What they did find was each other, after Daum published an online article describing her struggles with raising her daughter as a survivor of childhood sexual abuse. Brandt contacted Daum after reading the article and asked her if she wanted to create the resource that each of them had searched for. Despite two time zones and a country between them, Brandt and Daum worked together to talk to other parenting survivors and collect their stories. Through hundreds of emails, texts, and phone conversations Daum and Brandt created Parenting with PTSD: the impact of childhood abuse on parenting. Each essay included in Parenting with PTSD walks you through not the individual’s abusive experiences, but rather how these experiences have affected the author as a mother or father. Included are essays written by fathers, a queer woman expecting her first child, mothers from inside and outside of North America, women of different ethnicities, single and married parents. As well, essays by survivors who are creating trauma informed services show how it is possible not only to break the cycle for your family, but to use your trauma history to help others. Parenting with PTSD is a resource intended to help survivors prepare for parenthood, and support those in the throes of working to break the cycle through it. Whether you are a parent survivor or you provide medical, mental, or social health services to survivors, this book will provide insight into how triggers, flashbacks, and distorted cognitions come into play once a survivor becomes a parent. Parenting with PTSD is available in print and digital formats on Amazon beginning October 12, 2017. For more information visit the Parenting with PTSD website.